Kirk Pasich, founder and President of Blue Élan Records, always envisioned capturing the raw, emotional connection of Cindy Alexander’s acoustic performances, the sole focus being on the artist, her songs, free of any slick production and digital trickery. Nowhere to Hide is the inspiring result. The album was recorded in one single take featuring Cindy’s vocals, select harmonies, a grand piano, acoustic guitars and dobro. Kirk set the stage allowing the musicians to perform without restraints. The result is a collection of music that is honest with all its beautiful imperfections. 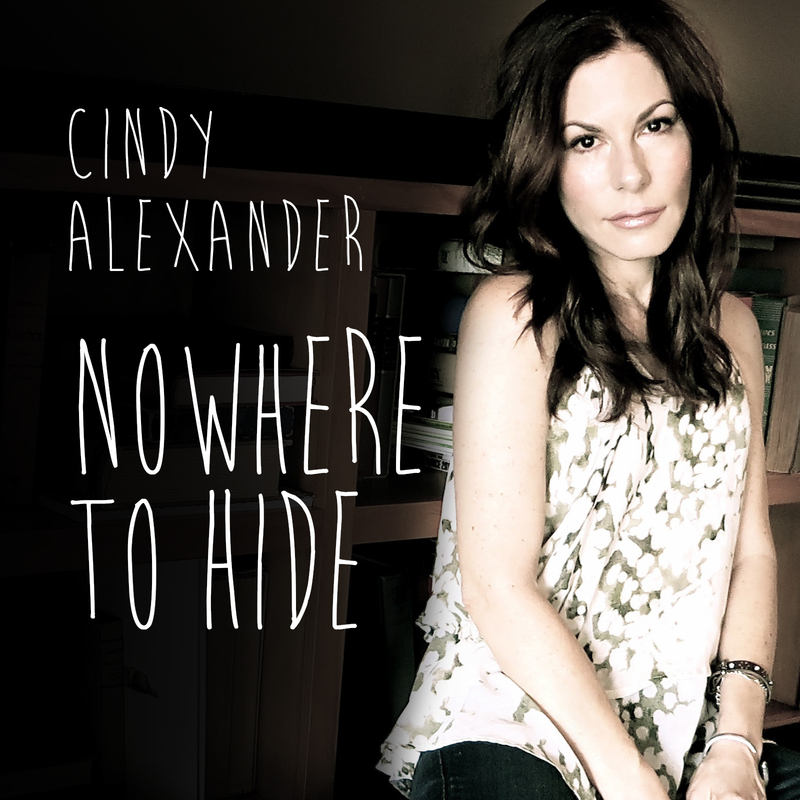 Most of the songs on Nowhere to Hide were chosen by Pasich from Cindy’s previously released albums (dating back to 1999). Other songs were selected by Cindy’s fans, whom she credits as responsible for her career, asking them to choose their favorites via social media. Nowhere to Hide also includes two new tunes, “Passenger” and “The Song Will Always Find You,” written by Cindy specifically for this record. In addition, Cindy may gain new fans with her stirring nostalgic covers of the Bread/David Gate’s classic “Everything I Own” and “Book of Love,” originally recorded by Peter Gabriel. Several of Cindy’s originals stand out quite clearly, such as “Soul Quake,” from the 2012 release Every Rise and Fall. “I wrote this song for my twin daughters when they were still in the womb” she said. “When I found out I was having twin girls, my first thought was: what if they fall in love with the same guy and break each other’s hearts? Over the years, ‘Soul Quake’ has come to have many meanings – it represents anything that shatters us in the moment, but forces us to emerge stronger and more enlightened because of it.” This particular version of “Soul Quake” is a duet with her friend and label mate, Grammy nominated Janiva Magness. Cindy has garnered a multitude of awards including David Foster’s/NBC Star Tomorrow, L.A. Music Awards Songwriter of the Year/ Independent Pop Album of the Year/ Producer’s Honors – Best of Last 25 Years Female Singer-Songwriters, All Access Magazine’s Best Female Pop Vocalist, and many more. Cindy has shared the stage with John Hiatt, Bacon Brothers, America, Suzanne Vega, Joan Osborn, Rick Springfield, Beth Hart, Everclear, The Bangles, Edwin McCain, Marc Cohn, etc. and has appeared on compilation cd’s alongside Sarah McLachlan (Chilled Sirens- Water Music Records), Aimee Mann (Eclectic Cafe – Water Music Records) and Norah Jones (Sunday Brunch – Treadstone Records). She has also appeared on soundtracks such as Sugar & Spice (Trauma Records), and has been featured in films like Here on Earth, Smokers, and Sugar & Spice. Cindy also made her mark on TV in shows like Party of 5, Chasing Farrah, and So You Think You Can Dance.